Updated: The Honorable Nancy Pelosi: "Between the Inevitable and the Unconceivable" ... "The Mueller Report will be released"
"Between the inevitable and the inconceivable ... The Mueller Report will be released." "There's an easy answer to this: Release the Mueller report as soon as possible ... And let me just say ... the Mueller report will be released. To us, it is inevitable ... to them it is inconceivable ... We have to shorten the distance between the inevitable and the inconceivable." "Release the report ... that is where the evidence is ... if they don't have anything to hide, they shouldn't worry." 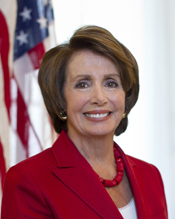 PELOSI, Nancy, (daughter of Thomas D'Alesandro, Jr.), a Representative from California; born Nancy D'Alesandro in Baltimore, Md., March 26, 1940; graduated from the Institute of Notre Dame, Baltimore, Md., 1958; A.B., Trinity College, 1962; chair, California state Democratic Party, 1981-1983; finance chairman, Democratic Senatorial Campaign Committee, 1985-1986; elected as a Democrat to the One Hundredth Congress, by special election, to fill the vacancy caused by the death of United States Representative Sala Burton of California, and reelected to the sixteen succeeding Congresses (June 2, 1987-present); minority whip (One Hundred Seventh Congress); minority leader (One Hundred Eighth, One Hundred Ninth, and One Hundred Twelfth through One Hundred Fifteenth Congresses); Speaker of the House (One Hundred Tenth, One Hundred Eleventh, and One Hundred Sixteenth Congresses).